12,650 lbs. (New Filters, Hopper Empty, Fuel Tank Full) 22" to 26"
A compact and versatile dust collector, the SAFE Systems DC19,000D is powered by a belt-driven 60 HP Diesel engine and carries 100 gallons of fuel onboard. This can be an electric driven fan as well. The fan and dust collector are rated at 19,000 CFM @ 20” WC. An inlet damper on the fan allows regulation of the airflow. 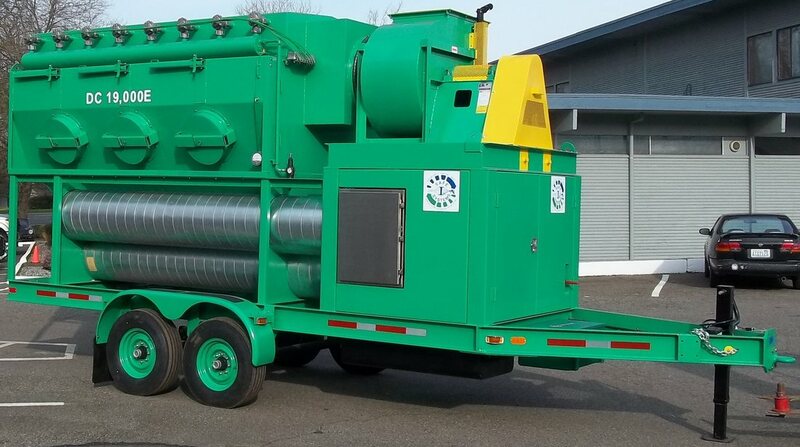 The trailer-mounted 19,000 cfm dust collector is “highway legal” with pintle hitch, dual 7,000# axles, electric brakes and the required lights. It has lifting eyes for handling by crane and can be transported on a double-drop semi-trailer, if needed. A large, container-style door makes filter access easy. This unit can be built as a skid mounted unit as well. The unit has six (6) 18” diameter dust inlets on each of two sides to give the user greater versatility. Only three (3) inlets are to be used at a time. The dust collector utilizes twenty-four (24) filter cartridges which are cleaned by an automatic pulsing system. The dust falls into the hopper where an auger system makes it easy to remove it into a standard 55 gallon drum. 30 cfm of compressed air is required for the pulsing system. Fan and dust collector rated for 19,000 CFM @ 20” W.C.
Six (6) dust inlets, 18” diameter, only three (3) to be used at one time. Automatic reverse pulse cleaning system for filters. ¾” air piping for pulse cleaning system. Air requirements for pulse cleaning system, 30 CFM @ 90 to 100 PSIG. Driven by a 60 HP John Deere engine with PTO clutch. 100 gallon diesel fuel tank. “On-board” flexible duct hose storage (up to 150 feet). Adjustable inlet damper on the fan for regulating the airflow. Secure (lockable) engine and fuel tank compartment. Ratchet take-up for easy belt tensioning. Dual speed hand crank for auger to remove dust from collection hopper. Dust discharges in standard 55 gallon drum (drum supplied by customer). Not intended to be towed with any dust in collection hopper. Recommend emptying dust every 2 to 4 hours depending on collection rate. It is recommended that all new filters be coated with precoat dust prior to putting into service. Tow vehicle must be of sufficient size and weight to safely and legally tow the machine. Tow vehicle must be equipped with a pintle style hitch.